GM manufactures cars and trucks in 34 countries and sells them in over 140 countries. These vehicles contain an array of more than 20 different engine sizes. To function well and to last a long time, these increasingly high-performance engines need a consistently high-quality oil, and that quality and uniformity needs to be available anywhere in the world. The dexos® specification is uniquely designed to complement the exacting requirements of GM's advanced engine technology. The specification has gone through an extensive developmental and testing process. It requires a number of proprietary tests that are not included in current industry standards and sets performance criteria at a level that exceeds many current standards. The result is a high performance fluid providing significant wear protection, improved piston cleanliness, a reduction in volatility and oil consumption, enhanced aeration control for improved fuel efficiency, and better oxidation properties. Dexos® is recommended by GM for use in all its vehicles except those with Duramax diesel engines requiring the use of API CJ-4 engine oil. Dexos® is fully backward-compatible and can be used in older vehicles. •Dexos1® is designed for use with gasoline engines and replaces GM-LL-A-025, GM6094M and GM4718M. •Dexos2™ is designed for use with light-duty diesel engines and replaces GM-LL-B-025 and GM-LL-A-025. Dexos1® Specifically designed to meet the needs of GM gasoline engines. •Improved viscometric properties, creating less friction in the engine, which contributes to improved fuel economy. •Resists aeration, which enables fuel-saving devices, such as Variable Valve Timing, to work optimally. •Offers improved protection against oxidation and deposits, allowing emission control systems to operate better. •Resists degradation between oil changes, extending the time and mileage interval between oil changes. •Protects diesel engines from harmful soot deposits. •Designed with limits on certain chemical components to prolong catalyst life and protect expensive emission reduction systems. •Resists degradation between oil changes and maintains optimum performance longer. * Duramax diesel engines require API CJ-4 engine oil. Afton Chemical, Chevron Oronite, Infineum and Lubrizol. 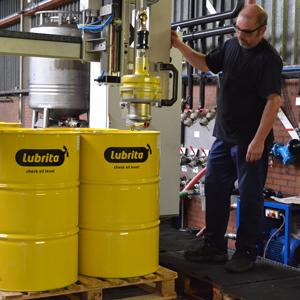 For more products please check Lubrita Passenger Vehicle Engine Oils product list or contact our technical department.